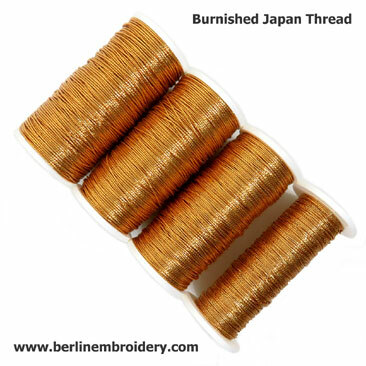 The British made Japanese threads are burnished in colour with a mat surface giving the thread an antique look and are a high quality Japanese thread. The synthetic foil wrapped around the thread core is sturdy and is unlikely to untwist and will not tarnish. Visit the Metal Thread Information page of my website for further information and pictures on how the thread can be used on an embroidery and FAQ about metal threads. 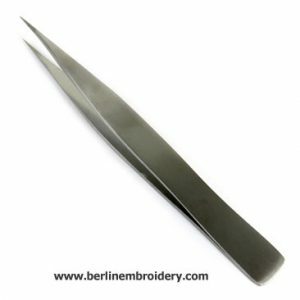 These very fine tip tweezers are excellent tools for a wide range of embroidery purposes and is the tool that I use the most for hand embroidery. They make great unpicking tools to grab those tiny threads your finger nails just can’t keep a hold of. 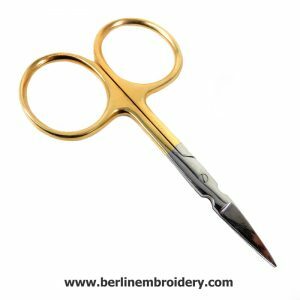 They are also a vital tool for Goldwork embroidery to hold, position and to manipulate metal threads. Au ver A Soie is the manufacturer of fine silk thread and yarns in France since 1820. Soie 100/3 is a fine twisted non-divisble 3 ply spun silk and comes as a 50 meter spool. 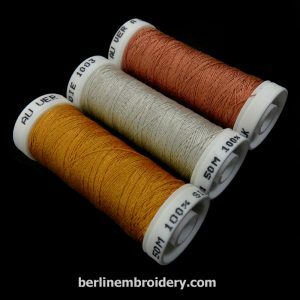 I have dark yellow (gold), grey (silver) and brown (copper), which can be used for couching down metal embroidery threads such as check threads, flatworm, Japan threads, large back, passing threads and rococco. A mellor also known as a mellore or melor is a perfectly manufactured tool for metal thread embroidery. The mellor is made out a soft smooth metal that is not abrasive. The narrower end is used as a stiletto to widen a hole in the ground fabric to plunge a heavy twisted cord or metal thread to the back. The round end is used to nudge and push metal threads into position and is gentler on the metal threads than using tweezers as the mellor has been polished and has smooth rounded edges so less likely to damage the metal thread. 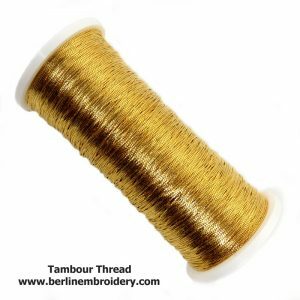 Tambour thread is a fine real metal thread that can be used for couching down other metal threads such as Check Thread, Flatworm, Japan Thread, Large Back, Passing Thread, Rococco and Starndard Lurex Thread. 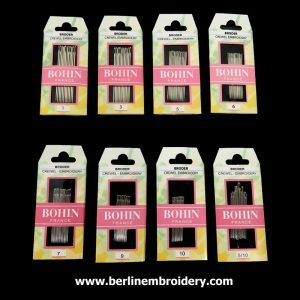 It can also be used in combination with other embroidery threads for surface embroidery, counted thread embroidery, weaving and lace making to add sparkle. 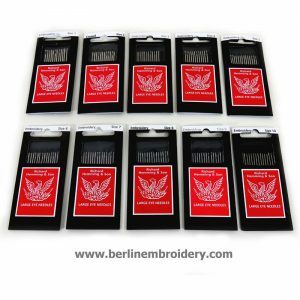 If you want an alternative synthetic thread that will not tarnish then you can use the Kreinik No. 1 Japan Thread. 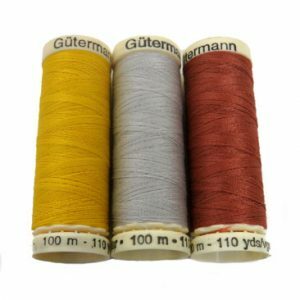 Guttermans polyester sewing thread is used to sew down felt and crochet cotton and the majority of metal threads in goldwork embroidery. 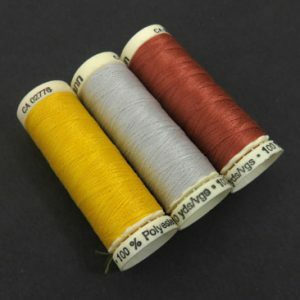 The polyester sewing thread is used over cotton or silk as it will not rot over time and is strong and not stretchy. 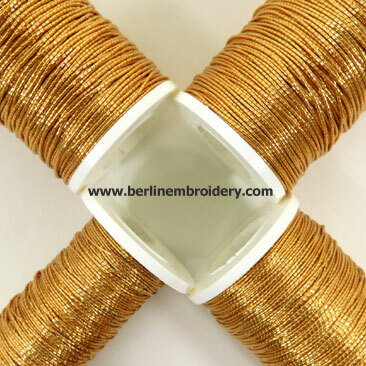 Yellow thread is used to sew down gold metal threads, grey thread for silver metal threads and brown for copper metal threads. 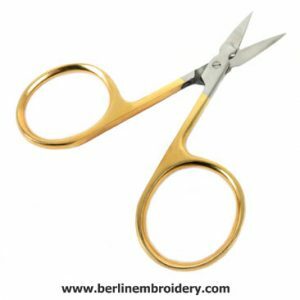 The goldwork scissors have a finely serrated blade which is perfect for goldwork embroidery. The blade grips the metal thread without damaging it so that you get a nice clean. The blades of the scissors are fine and sharp for precision cutting. 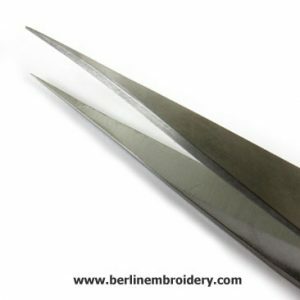 The finger holes are large for embroidery scissors, so they are easy to pick up and hold into position when cutting the metal threads. 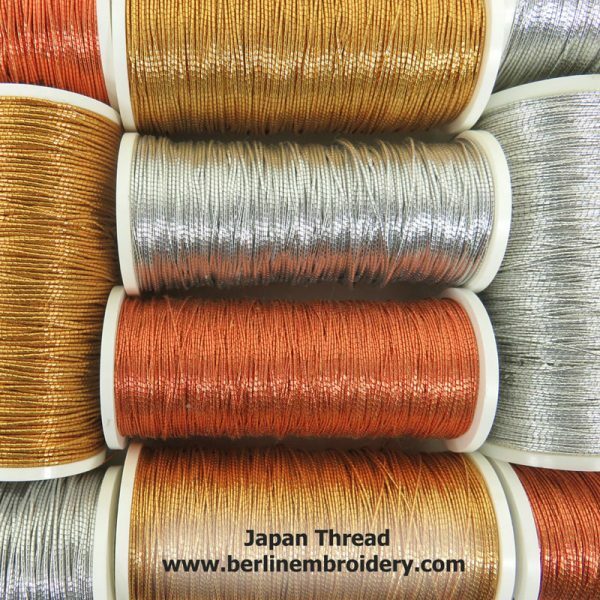 T69 Japan thread is the thickest of the four Japan threads is approximately 0.75 mm across the width of the thread (closest in size to No. 9 (K3) Japan Thread). T70 Japan thread is approximately 0.5 mm across the width of the thread (close in size to No. 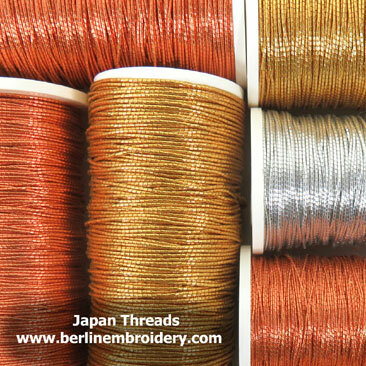 8 (K4) Japan Thread and Kreinik No. 7 Japan Thread). 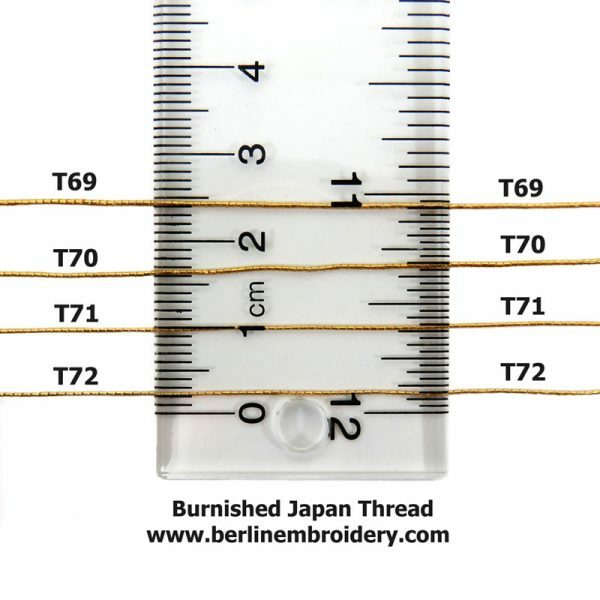 T71 Japan thread is approximately 0.35 mm across the width of the thread (close in size to Kreinik No. 5 Japan Thread). 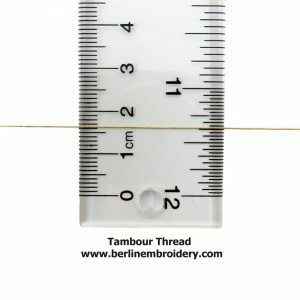 T72 Japan thread is the finest of the range approximately 0.25 mm across the width of the thread. Japan thread is usually couched down two threads at the time (as it fills in the design area faster) and couched down with the same colour sewing thread or a contrasting thread in a bricking fashion. If sewn down with a contrasting thread the Japan thread can be couched down in colour in a pattern or with a range of shades, this is known as Or Nue. Japan threads are used to fill in areas of a design or for fine lines.